Zelmira was the last opera Rossini wrote for the Teatro San Carlo and it succeeds in maintaining a constant, consistent level of musical excellence. 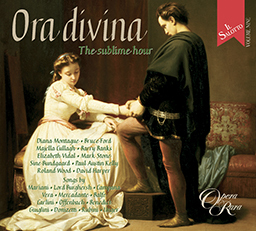 This is the first absolutely complete recording of the opera. 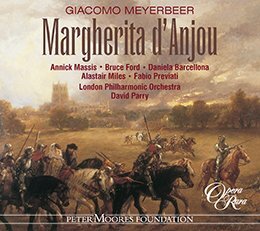 Impeccably cast, the two impossible tenor parts are sung here by the Rossini experts Bruce Ford (Antenore) and Antonino Siragusa (Ilo). The acclaimed American soprano Elizabeth Futral (Zelmira) and the gifted young Italian mezzo-soprano Manuela Custer (Emma), along with two newcomers, the basses Mirco Palazzi (Leucippo) and Marco Vinco (Polidoro) complete the distinguished line up. Zelmira was the last opera Rossini wrote for the Teatro San Carlo and it succeeds in maintaining a constant, consistent level of musical excellence. It is an opera in which we are likely to find ourselves challenged and delighted by the unexpected. 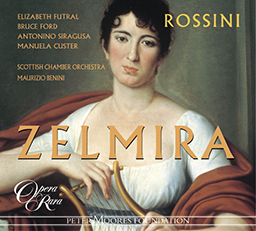 The Italian critic Luigi Bellingardi described it after the 1989 performance in Rome as “a forgotten masterpiece, with page after page of beautiful melodies matched to inventive harmony and skilled vocal and orchestral writing.” This recording will help gain Zelmira the recognition it deserves one of the most dramatic and carefully written of all Rossini’s operas. 01 Zelmira: Act I scena I: Introduction – Oh sciagura! 02 Zelmira: Act I scena I: Ciel! che avvenne? 03 Zelmira: Act I scena I: Cavatina: Che vidi! amici! oh eccesso! 05 Zelmira: Act I scena I: Cabaletta: Sorte! secondami! 07 Zelmira: Act I scena II: scena: Non fuggirmi ? 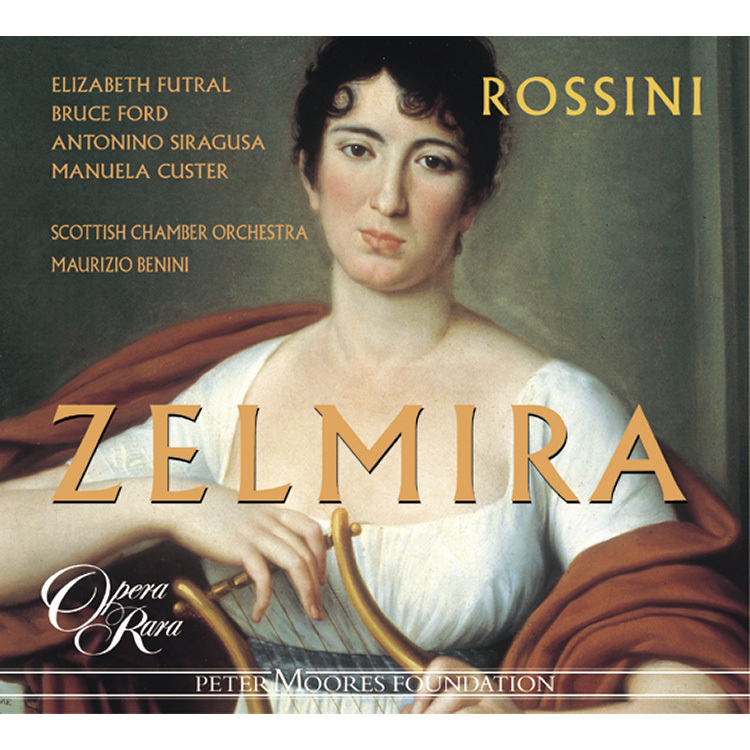 08 Zelmira: Act I scena III: Cavatina: Ah! gia trascorse il di ? 09 Zelmira: Act I scena IV: Recitative: Ma m’illude il desio? 15 Zelmira: Act I scena V: Cabaletta: Cara! deh attendimi! 16 Zelmira: Act I scena V: Recitative: Godi, o Signor: che piu a bramar ti resta? – scena VI: Oh Cielo! 17 Zelmira: Act I scena VI: Duet: A che quei tronchi accenti? 20 Zelmira: Act I scena VI: Stretta: Che mai pensar? che dir ? 44 Zelmira: Act II scena V: Quintet: Ah! m’illuse un sol momento! 47 Zelmira: Act II scena VI: Recitative: Periglioso e l’indugio; Ilo potria – scena VII: Emma ? non sai ? The curtain rises abruptly – there is no overture – on a vast plain outside the walls of the city of Lesbos. To one side there is an imposing portal leading to the underground mausoleum of the kings of the island state. We are greeted by a scene of confusion – demoralised troops from Mytilene wander about in disorder, for it has just been discovered that Azor, the lord of Mytilene and the invader of Lesbos, has been found murdered in his bed. Leucippo and Antenore appear – the latter ostensibly one of Azor’s most trusted right-hand men. They express incredulity and dismay at what has happened, and Leucippo insinuates to the Mytilenian soldiers that Antenore is the person best placed to avenge the murdered ruler, and to be his successor. When Leucippo and Antenore are left alone, we begin to discover the true state of affairs. Antenore is no more nor less than an unscrupulous and ambitious opportunist who aims at the combined thrones of Mytilene and Lesbos, while Leucippo, his willing tool, has actually carried out the murder. Antenore observes, however, that even with Azor eliminated, there are still obstacles in his path. The old royal family of Lesbos is not yet extinct: the aged king Polidoro is generally believed dead, betrayed by his evil daughter Zelmira to Azor’s bloodlust, but Zelmira herself still lives, as well as the infant son she has borne her husband, Ilo, a prince of Troy. Both Antenore and Leucippo agree that the blacker they can paint Zelmira, the more it will assist their cause. With this in mind, Leucippo is already laying false leads designed to result in Zelmira’s being accused of Azor’s murder. We now encounter Zelmira herself, together with her friend and confidante Emma. In this particular moment, however, Emma spurns her friend, appalled by the thought that she has been so unnatural as to deliver up her aged father to his foes. Zelmira protests her innocence and, swearing Emma to secrecy, leads her to the entrance to the subterranean mausoleum. Scene Two. The subterranean hall containing the royal tombs. Polidoro, far from being dead, has been secretly concealed here by Zelmira. The story she told Azor that he was being sheltered by the priests of Ceres – a story which to her horror caused Azor to burn the temple of Ceres to the ground – was only a fabrication to detract attention from his real whereabouts. Father and daughter greet each other warmly, and Emma, overjoyed to discover Zelmira innocent of the crimes which have been imputed to her, upbraids herself for having ever doubted her. Distant shouts and sounds of a military march are heard, and Zelmira and Emma depart to find out what has happened. Scene Three. A square in the centre of Lesbos, where Ilo, Zelmira’s husband, is greeted as he returns from a campaign in defence of his states. He looks forward to being reunited with Zelmira and his son, and, unaware of the events that have transpired in his absence, sends his trusty friend Eacide to the palace to announce his return to his father-in-law, Polidoro. When Zelmira appears, she greets Ilo with constraint, inhibited from telling him the true state of affairs in Lesbos by the presence of a number of his men. He is immediately aware that she is ill at ease, and becomes increasingly alarmed as she answers all his questions with prevarications. Emma enters in haste, urging Zelmira to flee since Antenore is spreading reports that she is Azor’s murderer. Ilo is left dismayed and perplexed, and in this state of uncertainty is found by Antenore and Leucippo. They pretend to commiserate with him, telling him that he had no sooner left for the wars than Zelmira had invited Azor to Lesbos and become his paramour. Ilo, his mind increasingly poisoned, retires tormented, but not before he has overheard a delegation of priests offering Antenore the crown of Lesbos. Harrassed on every side, Zelmira entrusts her infant son to Emma’s care. Scene Four. In a magnificent hall in the palace, Antenore is crowned King of Lesbos. Declaring that his entire aim will be to restore the kingdom to its former glory, he goes to present himself to the people. Ilo, believing himself betrayed by Zelmira, and unable to discover the whereabouts of his son, enters in the greatest mental stress, and collapses in a faint. There Leucippo finds him, and believing that the moment is ripe for eliminating a further major obstacle in Antenore’s path, he draws a dagger and advances to slay him. He is, however, prevented from striking the blow by Zelmira, who, appearing in this moment of crisis, succeeds in disarming him. Far from being abashed, he manages to rouse Ilo, and, showing him Zelmira standing there holding the dagger, convinces him that he has narrowly escaped being murdered by his own wife. Antenore, who returns at this moment, orders that Zelmira be arrested and held over for punishment. Leucippo brings Antenore a letter he has intercepted. Written by Zelmira from prison, it is addressed to Ilo. It assures him that she is no parricide, and urges him to come to her rescue. For Antenore and Leucippo it brings the first suspicion that Polidoro may have survived the burning of the temple of Ceres, and, upon Leucippo’s advice, Antenore decides to free Zelmira and keep watch on her movements. Emma has decided that the safest place for Zelmira’s son is in the underground mausoleum with Polidoro. She sends two of Zelmira’s handmaidens to conduct him safely thither. The plain outside the entrance to the mausoleum. Ilo laments his inability to hate Zelmira as he believes she deserves. He also continues to be distressed at his inability to trace his son. But at this moment Polidoro, concerned that he has heard no more from Zelmira, emerges from his hiding-place. Father-in-law and son-in-law throw themselves into each other’s arms, and Ilo is overjoyed to be reassured of his wife’s innocence. He offers to conduct Polidoro to safety aboard his ship, but Polidoro believes, in his unarmed state, that he is probably safer and better off where he is. He therefore returns to his hiding-place while Ilo hastens to gather his followers in preparation for an attempt to rescue Zelmira. Meanwhile, however, Antenore has put into effect his ruse to release Zelmira and dog her steps. She enters, with Antenore and Leucippo observing her from a distance. Emma brings her news that she has just encountered Ilo, who has entrusted her with a message to say that, convinced now of her innocence, he is hastening to her relief, and looks forward to reuniting her with her father. Overhearing this, Antenore and Leucippo come forward, accusing her of trying to deceive them. She understandably but wrongly assumes that Ilo will have taken Polidoro on board his vessel, so no longer tries to conceal that her reporting him concealed in the temple of Ceres was a ruse to deflect suspicion from his true hiding place, the royal mausoleum. Leucippo, who a few moments earlier had seen Ilo hastening back to his fleet – and who had noted that he was alone – immediately leads a detachment of guards into the tomb, and Zelmira realises that, all unwittingly, she has betrayed her father’s retreat. Polidoro is led out a prisoner, and though Zelmira pleads to die in his stead, it is clear that Antenore has every intention of killing them both. The Mytilenian warriors advance with an urn containing Azor’s ashes, calling for vengeance upon his murderer, and Antenore denounces Zelmira as the guilty party. The warriors call for her death, while Emma and the handmaidens plead for mercy. Zelmira and Polidoro are led away to prison. Emma and her companions hurry to inform Ilo of the disaster that has befallen Zelmira and Polidoro, and he hastens to their rescue. Scene Three, The underground dungeon where Zelmira and Polidoro have been imprisoned. Weak and exhausted, Polidoro has fainted, but Zelmira tenderly watches over him until he regains consciousness. The door to the dungeon opens, and Antenore and Leucippo appear, intent upon their murderous mission. Zelmira throws herself before her father, determined to shield him from their blows. She even suggests that he would be willing to relinquish the throne in return for his life, but Polidoro sternly rejects such a proposal. At this moment noises from without announce the approach of Ilo and his men. Antenore draws his sword to slay Polidoro, but Zelmira produces a dagger which she has had concealed about her, and succeeds in holding him at bay until one wall of the dungeon, battered from without, collapses and allows entry to the rescuing forces. Antenore and Leucippo are disarmed and led away to their fate. Ilo is reunited with Zelmira and Polidoro, and Emma and the handmaidens appear with Zelmira’s son. The opera ends as Polidoro prepares to remount his throne, and Zelmira expresses her wonderment that so many trials and sufferings should so suddenly and unexpectedly be succeeded by joy and celebration. Polidoro, der betagte König der Insel Lesbos, ist Witwer, seine einzige Tochter Zelmira hat den trojanischen Fürsten Ilo geheiratet. Die beiden haben einen kleinen Sohn, dessen Name ungenannt bleibt. Polidoro blickt auf eine lange, friedliche Regierungszeit zurück, wobei ihm seit einigen Jahren seine Tochter und sein Schwiegersohn zur Seite stehen. Dann wird Ilo nach Troja zurückgerufen, um seine Heimat gegen Eindringlinge zu verteidigen. Azor, der Stadtfürst von Mytilene (eine Lesbos untergebene Stadt) macht sich die relative Schwäche des Inselstaats zunutze, um Kontrolle über das gesamte Königreich zu gewinnen. Aus Sorge um die Sicherheit ihres Vaters versteckt Zelmira ihn in den unterirdischen königlichen Grabkammern, lässt aber bekannt werden, dass er Zuflucht im Ceres-Tempel gesucht habe. Als Azor daraufhin diesen Tempel in Schutt und Asche legt, wird allgemein angenommen, dass Polidoro umgekommen sei und Zelmira ihn verraten habe, weil sie eine sexuelle Beziehung mit Azor unterhalte. Doch Azor kann sich nicht lange an seinem Triumph freuen. Antenore, ein ihm unterstellter ehrgeiziger Leutnant, schmiedet mit der Hilfe seines Freundes Leucippo Pläne, um ihn zu stürzen. Die Oper beginnt in medias res, in eben dem Augenblick, da entdeckt wird, dass Azor hinterhältig ermordet wurde. Der Vorhang hebt sich unvermittelt – es gibt keine Ouvertüre – vor einer weiten Ebene außerhalb der Stadtmauern von Lesbos. Zu einer Seite ragt ein imposantes Portal auf, das zum unterirdischen Mausoleum der Inselkönige führt. Uns bietet sich ein Bild des Chaos – demoralisierte Soldaten aus Mytilene streifen ziellos umher, denn gerade haben sie erfahren, dass ihr Herrscher Azor ermordet in seinem Bett aufgefunden wurde. Leucippo und Antenore treten auf und bringen ihre Ungläubigkeit und Bestürzung über den Mord zum Ausdruck. Leucippo gibt den Soldaten zu verstehen, dass Antenore am besten geeignet sei, den getöteten Herrscher zu rächen und seine Nachfolge anzutreten. Als Leucippo und Antenore schließlich allein sind, kommt allmählich die Wahrheit ans Licht: Antenore ist ein ruchloser, ehrgeiziger Opportunist, der den Mord von seinem bereitwilligen Helfer Leucippo begehen ließ. Antenore gibt zu bedenken, dass seine Machtposition auch nach der Beseitigung Azors keineswegs ungefährdet ist, da die alte Königsfamilie von Lesbos noch nicht völlig ausgeschaltet ist: Polidoro mag aufgrund von Zelmiras Verrat zwar tot sein, doch Zelmira selbst ist noch am Leben, ebenso wie ihr kleiner Sohn. Leucippo und Antenore einigen sich darauf, zur Förderung ihrer Pläne Zelmira nach Kräften in Verruf zu bringen. Deshalb setzt Leucippo das Gerücht in die Welt, Azor sei von Zelmira selbst ermordet worden. Dann begegnen wir Zelmira mit ihrer Vertrauten Emma. In diesem Augenblick steht Emma ihrer Freundin allerdings sehr ablehnend gegenüber, glaubt sie doch, diese habe widernatürlich gehandelt und ihren Vater seinen Feinden ausgehändigt. Zelmira beteuert ihre Unschuld und führt sie, nachdem sie Emma zu Stillschweigen verpflichtet hat, zum Eingang des unterirdischen Mausoleums. Ein unterirdischer Saal mit den Königsgräbern, in dem Polidoro von Zelmira verborgen wurde. Vater und Tochter begrüßen sich aufs Innigste. Emma ist überglücklich, dass Zelmira das ihr vorgeworfene Verbrechen nicht begangen hat, und überhäuft sich mit Selbstvorwürfen, wie sie ihrer Freundin je misstrauen konnte. Als aus der Ferne Rufe und Militärmusik erklingen, eilen Zelmira und Emma davon, um die Ursache dafür zu entdecken. Ein Marktplatz mitten in Lesbos. Ilo, Zelmiras Mann, ist soeben von einem Feldzug zur Verteidigung seiner Heimat zurückgekehrt und wird von der Bevölkerung begrüßt. Er freut sich darauf, Zelmira und seinen Sohn wiederzusehen. Da er die Ereignisse, die in seiner Abwesenheit vorgefallen sind, nicht kennt, schickt er seinen Freund Eacide zum Palast, um seinem Schwiegervater Polidoro seine Rückkunft zu melden. Als Zelmira auftritt, begrüßt sie Ilo sehr zurückhaltend; sie will ihm nicht in Gegenwart seiner Männer von den Ereignissen berichten. Ihm fällt sofort auf, dass sie bedrückt ist, und sein Misstrauen wächst, als sie all seine Fragen nur ausweichend beantwortet. Emma tritt hinzu und drängt Zelmira zur Flucht, weil Antenore verbreiten lässt, dass sie Azor ermordet habe. Beklommen und bestürzt bleibt Ilo zurück, und in diesem Zustand treffen Leucippo und Antenore ihn an. Sie heucheln Mitgefühl für seine Lage und berichten, er sei kaum ins Feld gezogen, als Zelmira Azor nach Lesbos kommen ließ und seine Geliebte wurde. Ilo, dessen Gedanken immer bitterer werden, zieht sich gequält zurück, doch zuvor hört er, dass eine Abordnung von Priestern Antenore die Krone von Lesbos anbieten. Zelmira fühlt sich von allen Seiten bedrängt und vertraut ihren Sohn der Fürsorge Emmas an. In einem prachtvollen Saal des Palasts wird Antenore zum König von Lesbos gekrönt; er erklärt, sein einziges Ziel sei, das Reich zu seiner einstigen Größe zurückzuführen. Dann tritt er vors Volk. Ilo ist innerlich aufgewühlt, denn er glaubt nicht nur, dass Zelmira ihn betrogen hat, er kann auch seinen Sohn nicht finden. Vor Kummer bricht er ohnmächtig zusammen. So wird er von Leucippo entdeckt, der ein weiteres Hindernis für Antenore aus dem Weg zu räumen hofft, einen Dolch zieht und ihn erstechen will. Doch bevor er zustoßen kann, taucht Zelmira auf und entwaffnet ihn. Kaltblütig erweckt Ilo ihn aus seiner Ohnmacht und zeigt dann auf Zelmira, die mit dem gezückten Dolch dasteht. So kann er Ilo überzeugen, dass er nur knapp dem Tod durch die Hand seiner eigenen Frau entronnen ist. In dem Moment erscheint Antenore und befiehlt, Zelmira zu ergreifen und festzusetzen, bis sie ihrer Strafe zugeführt wird. Leucippo überreicht Antenore einen Brief, den er abgefangen hat: Ein Schreiben der eingekerkerten Zelmira an Ilo. Darin versichert sie ihm, dass sie nicht des Vatermords schuldig ist, und fleht ihn an, sie zu retten. Nun schöpfen Leucippo und Antenore erstmals Verdacht, dass Polidoro den Brand des Ceres-Tempels möglicherweise überlebt haben könnte, und auf Leucippos Rat hin beschließt Antenore, Zelmira freizulassen, sie aber auf Schritt und Tritt zu beobachten. Emma ist zu der Entscheidung gekommen, dass Zelmiras Sohn am sichersten bei Polidoro im unterirdischen Mausoleum aufgehoben ist, und beauftragt zwei Mägde Zelmiras, ihn dorthin zu bringen. Die Ebene vor dem Eingang zum Mausoleum. Ilo bedauert, dass es ihm nicht gelingen will, Zelmira zu hassen, und gleichzeitig ist er beunruhigt, weil er noch immer seinen Sohn nicht finden kann. In diesem Moment erscheint Polidoro aus seinem Versteck; er ist besorgt, nichts mehr von Zelmira gehört zu haben. Die beiden Männer fallen sich in die Arme, und Ilo ist überglücklich, dass seine Frau tatsächlich unschuldig ist. Er schlägt Polidoro vor, ihn auf sein Schiff in Sicherheit zu bringen, doch der betagte König ist der Ansicht, dass das Mausoleum, unbewaffnet wie er ist, ein besseres Versteck ist. So kehrt er dorthin zurück, während Ilo rasch seine Männer um sich schart, um Zelmira zu befreien. Mittlerweile hat Antenore jedoch Zelmira freigelassen und beobachtet sie nun. Sie tritt auf, Antenore und Leucippo folgen in einigem Abstand. Emma bringt ihr die Nachricht, dass sie soeben mit Ilo gesprochen habe und ihr ausrichten soll, dass er nun von ihrer Unschuld überzeugt ist, alles daran setzt, sie zu retten, und sich darauf freue, sie und ihren Vater zu vereinen. Das hören Antenore und Leucippo, sie treten vor und beschuldigen Zelmira, Antenore verraten zu wollen. Diese geht verständlicherweise vom irrtümlichen Glauben aus, dass Ilo ihren Vater auf sein Schiff in Sicherheit gebracht hat und gesteht freimütig, dass es lediglich eine List war zu verbreiten, sie habe ihn im Ceres-Tempel versteckt, um von seinem wahren Zufluchtsort, dem Mausoleum, abzulenken. Nur wenige Momente zuvor hatte Leucippo bemerkt, dass Ilo zu seiner Flotte zurückeilte – aber alleine. Sofort führt er eine Gruppe Soldaten zum Mausoleum – und Zelmira erkennt, dass sie unwillentlich nun doch das Versteck ihres Vaters verraten hat. Polidoro wird als Gefangener heraus geführt. Zelmira fleht seine Häscher an, sie an seiner Statt zu töten, doch es ist unverkennbar, dass Antenore sie beide beseitigen will. Die Soldaten aus Mytilene treten auf mit der Urne, die die Asche Azors enthält, und verlangen Rache für den Mord. Da verkündet Antenore, dass Zelmira die Schuldige sei. Die Soldaten fordern ihren Kopf, während Emma und die Zofen um Gnade flehen. Zelmira und Polidoro werden in den Kerker abgeführt. Emma und ihre Gefährtinnen laufen zu Ilo, um ihm von der neuesten Entwicklung zu berichten, und er eilt Zelmira und Polidoro zu Hilfe. Das unterirdische Verlies, in dem Zelmira und Polidoro gefangen gehalten werden. Der König hat vor Schwäche und Erschöpfung das Bewusstsein verloren, und Zelmira wacht liebevoll über ihn, bis er wieder zu sich kommt. Die Tür des Verlieses geht auf, und Antenore und Leucippo treten ein, um ihren Mordplan auszuführen. Zelmira wirft sich vor ihren Vater, um ihn mit ihrem Körper vor den Dolchstichen zu schützen. Sie schlägt ihm vor, im Gegenzug für sein Leben auf den Thron zu verzichten, doch dieses Ansinnen lehnt Polidoro kategorisch ab. In diesem Augenblick verkündet der Lärm von draußen, dass Ilo und seine Männer nahen. Antenore zückt sein Schwert, um Polidoro zu töten, doch Zelmira greift zu einem Dolch, den sie in ihrer Kleidung versteckt hat, und es gelingt ihr, den Angreifer abzuwehren, bis eine der Kerkermauern dem Ansturm Ilos und seiner Leute nachgibt und einstürzt; wenig später dringen die Retter ins Verlies vor. Antenore und Leucippo werden entwaffnet und abgeführt. Ilo wirft sich Zelmira und Polidoro in die Arme, und dann treten Emma und die Zofen mit Zelmiras Sohn auf. Als die Oper endet, trifft Polidoro Vorbereitungen, wieder den Thron zu besteigen, und Zelmira verleiht ihrer Verwunderung Ausdruck, dass die vielen Prüfungen und das große Leid so plötzlich und unerwartet in Freude und Jubel übergehen. L’anziano re dell’isola di Lesbo, Polidoro, è vedovo con una figlia unica, Zelmira, che è andata sposa al principe troiano, Ilo. Zelmira e Ilo hanno un bambino (senza nome). Polidoro ha governato a lungo e pacificamente, negli ultimi tempi affiancato dalla figlia e dal genero, finché Ilo è stato richiamato in patria, a Troia, per difenderla da un invasore. A questo punto Azor, signore della città di Mitilene (città dipendente da Lesbo), approfittando del fatto che l’isola si trovava relativamente indifesa, ha cercato di impadronirsi del regno. Per salvare suo padre, Zelmira lo ha nascosto nelle tombe reali sotterranee, spargendo di proposito la voce che il re si è rifugiato nel Tempio di Cerere. Azor ha immediatamente fatto incendiare il Tempio di Cerere. Di conseguenza, tutti pensano che Polidoro sia morto e sospettano che Zelmira l’abbia tradito e abbia una relazione con l’usurpatore. La presa di potere di Azor si rivela però di breve durata. Antenore, uno dei suoi ambiziosi luogotenenti, con l’aiuto dell’amico Leucippo, trama per rovesciarlo. L’opera si apre in medias res, nel momento in cui si scopre che Azor è stato assassinato a tradimento. Il sipario si alza bruscamente, senza ouverture, su una vasta pianura fuori dalle mura della città di Lesbo. Da un lato si trova un imponente portale che conduce al mausoleo sotterraneo dei re dell’isola. La confusione regna: i soldati delle truppe di Mitilene si aggirano in disordine, demoralizzati, perché hanno appena scoperto che il loro sovrano Azor è stato trovato assassinato nel proprio letto. Entrano Leucippo e Antenore i quali manifestano incredulità e sgomento per l’accaduto. Leucippo insinua ai soldati di Mitilene che Antenore è la persona nella posizione migliore per vendicare l’assassinio del sovrano e succedergli. Quando Leucippo e Antenore sono rimasti soli, comincia a emergere la vera situazione. Antenore è un opportunista ambizioso e senza scrupoli, mentre Leucippo, suo compiacente burattino, è il vero autore dell’omicidio. Antenore osserva però che, nonostante Azor sia stato eliminato, rimangono ancora degli ostacoli sul suo cammino. L’antica stirpe reale di Lesbo non è ancora estinta: per quanto generalmente si pensi che il vecchio re Polidoro sia morto, tradito dalla figlia, Zelmira è pur sempre in vita, e con lei il suo bambino. Antenore e Leucippo concordano che per agevolare la loro causa è necessario gettare fango il più possibile su Zelmira. Proprio per questo Leucippo sta già spargendo false voci che portino ad accusarla dell’assassinio di Azor. Adesso incontriamo Zelmira con la sua amica e confidente Emma. In questo particolare momento però Emma manifesta disprezzo per la sua amica, inorridita al pensiero che possa essere stata talmente snaturata da consegnare l’anziano padre ai suoi nemici. Zelmira protesta la propria innocenza e, dopo aver convinto Emma a giurare di mantenere il segreto, la conduce all’ingresso del mausoleo sotterraneo. Scena seconda. La sala sotterranea che ospita le tombe reali. Polidoro, che non è morto, è stato nascosto qui segretamente da Zelmira. Padre e figlia si salutano con affetto ed Emma, sopraffatta dalla gioia di scoprire che Zelmira è innocente dei crimini che le sono stati imputati, si rimprovera per aver dubitato di lei. In lontananza si sentono delle grida e il suono di una marcia militare e Zelmira ed Emma escono per scoprire cosa è accaduto. Scena terza. Una piazza al centro di Lesbo. Ilo, il marito di Zelmira, viene accolto al suo ritorno da una campagna in difesa dei suoi stati. Non vede l’ora di riabbracciare Zelmira e il figlioletto e, ignaro degli eventi che si sono svolti durante la sua assenza, invia il fidato amico Eacide al palazzo per annunciare il proprio ritorno al suocero Polidoro. Al suo arrivo, Zelmira saluta Ilo con imbarazzo; la presenza degli uomini del marito le impedisce di rivelargli la vera situazione a Lesbo. Ilo coglie immediatamente il disagio della moglie e il suo allarme cresce quando la donna risponde evasivamente a tutte le sue domande. Emma entra di fretta e sollecita Zelmira a fuggire poiché Antenore sta spargendo la voce che lei è l’assassina di Azor. Ilo rimane sgomento e perplesso, e in questo stato di incertezza lo trovano Antenore e Leucippo che fingono di compiangerlo e gli raccontano che appena dopo la sua partenza per la guerra Zelmira ha invitato Azor a Lesbo e ne è diventata l’amante. Ilo, sempre più disperato, si ritira, ma non prima di aver sentito un delegazione di sacerdoti offrire ad Antenore la corona di Lesbo. Incalzata da ogni parte, Zelmira affida il suo bambino alle cure di Emma. Scena quarta. In una magnifica sala del palazzo Antenore viene incoronato re di Lesbo. Dichiara che il suo intero scopo sarà quello di riportare il regno ai suoi passati fasti e quindi va a presentarsi al popolo. Convinto di essere stato tradito da Zelmira e non riuscendo a scoprire dove si trova il figlio, Ilo si lascia prendere dalla disperazione e cade, svenuto. Lo trova Leucippo e, pensando che sia il momento propizio per eliminare un altro grosso ostacolo dalla via di Antenore, sguaina una spada e si avanza per ucciderlo. Ma non riesce a vibrare il colpo perché Zelmira compare in questo momento di crisi e riesce a disarmarlo. Per nulla sconcertato, Leucippo riesce a fare rinvenire Ilo e, indicandogli Zelmira ancora con la spada in mano, lo convince che è riuscito appena a scampare alla morte per mano della propria moglie. In questo momento rientra Antenore e ordina che Zelmira venga arrestata e detenuta per essere processata. Leucippo porta ad Antenore una lettera da lui intercettata, scritta da Zelmira in prigione e destinata a Ilo. Nella lettera la donna assicura il marito di non essere una parricida e gli chiede di andare a soccorrerla. Antenore e Leucippo cominciano a sospettare che Polidoro possa essere sopravvissuto all’incendio del Tempio di Cerere e, su consiglio di Leucippo, Antenore decide di liberare Zelmira e tenere d’occhio i suoi movimenti. Emma ha deciso che il posto più sicuro per il bambino di Zelmira è il mausoleo sotterraneo dove si trova Polidoro e invia due ancelle di Zelmira a condurlo lì al sicuro. Scena seconda. La spianata davanti all’ingresso del mausoleo. Ilo si lamenta perché non riesce a odiare Zelmira come pensa che la donna si meriti. Continua anche ad essere tormentato dalla sua incapacità di ritrovare il figlio. Ma in questo momento esce dal nascondiglio Polidoro, preoccupato di non avere più notizie da Zelmira. Suocero e genero si gettano l’uno nelle braccia dell’altro e Ilo è sopraffatto dalla gioia adesso che l’innocenza di sua moglie è confermata. Si offre di condurre Polidoro al sicuro a bordo della sua nave, ma Polidoro ritiene, in quanto disarmato, che sia più sicuro rimanere dove si trova. Così ritorna nel suo nascondiglio, mentre Ilo si affretta a riunire i suoi per preparasi a un tentativo di salvare Zelmira. Nel frattempo, però, Antenore ha posto in atto il suo stratagemma di liberare Zelmira e seguirla. La donna entra, mentre Antenore e Leucippo la osservano da lontano. Emma le riferisce di avere appena incontrato Ilo il quale l’ha incaricata di dire che ormai è convinto della sua innocenza, verrà subito a soccorrerla e si augura di poterla riunire con suo padre. Udito questo Antenore e Leucippo si fanno avanti e l’accusano di cercare di ingannarli. La donna, per un comprensibile malinteso, immagina che Ilo abbia condotto Polidoro a bordo della sua nave e non cerca più di negare che la notizia che il padre si nascondeva nel tempo di Cerere fosse in realtà uno stratagemma per sviare i sospetti dal suo vero nascondiglio, il mausoleo reale. Avendo visto poco prima Ilo precipitarsi verso la sua flotta da solo, Leucippo immediatamente conduce un distaccamento di guardie nella tomba e Zelmira capisce che, senza volerlo, ha svelato il nascondiglio del padre. Polidoro viene condotto fuori prigioniero e, nonostante le suppliche di Zelmira che desidera morire al suo posto, è chiaro che Antenore ha ogni intenzione di ucciderli entrambi. I guerrieri di Mitilene avanzano con un’urna contenente le ceneri di Azor, chiedendo vendetta contro il suo assassino, e Antenore denuncia Zelmira: è lei la colpevole. I guerrieri chiedono la sua morte, mentre Emma e le ancelle supplicano clemenza. Zelmira e Polidoro vengono condotti via alla prigione. Emma e i suoi compagni si affrettano a informare Ilo del disastro che si è abbattuto su Zelmira e Polidoro e l’uomo parte per soccorrerli. Scena terza La prigione sotterranea dove sono stati imprigionati Zelmira e Polidoro. Debole e spossato, Polidoro ha perso i sensi, ma Zelmira veglia amorosamente su di lui finché non si riprende. Si apre la porta del sotterraneo ed entrano Antenore e Leucippo, decisi ad assassinarli entrambi. Zelmira si frappone tra loro e il padre, decisa a fargli scudo contro i loro colpi. Gli chiede persino se è disposto ad abbandonare il trono per aver salva la vita, ma Polidoro respinge severamente la proposta. A questo punto alcuni rumori dall’esterno annunciano l’avvicinarsi di Ilo e dei suoi uomini. Antenore sguaina la spada per uccidere Polidoro, ma Zelmira tira fuori un pugnale che teneva nascosto e riesce a tenerlo a bada finché non crolla una parete della prigione, e finalmente entrano le forze di soccorso. Antenore e Leucippo vengono disarmati e condotti al loro destino. Ilo riabbraccia Zelmira e Polidoro, ed Emma e le ancelle entrano con il bambino di Zelmira. L’opera termina mentre Polidoro si prepara a riprendere il trono e Zelmira esprime la propria meraviglia nel constatare con quale rapidità la gioia e i festeggiamenti abbiano sostituito le dure prove e le sofferenze. Les événements qui ont précédé le début de l’opéra. . . Le vieux Polidoro, roi de Lesbos, est veuf depuis longtemps. Son unique enfant, Zelmira, a épousé un prince troyen, Ilo, qui lui a donné un fils (dont le nom n’est pas dit). Aidé dans sa tâche par sa fille et son gendre, Polidoro poursuit son long règne paisible. Malheureusement, Ilo est rappelé à Troie pour défendre sa patrie contre l’envahisseur. C’est le moment choisi par Azor, seigneur de Mytilène (ville sous la juridiction de Lesbos), pour s’attaquer à l’île relativement peu défendue et prendre le contrôle du royaume entier. Pour sauver son père, Zelmira le cache dans le souterrain où se trouve le mausolée de la famille royale, et prétend publiquement qu’il a trouvé refuge dans le temple de Cérès. Azor s’étant empressé d’incendier le temple, Polidoro passe généralement pour mort et Zelmira, dont le peuple croit qu’elle a trahi son père, est soupçonnée d’avoir une liaison amoureuse avec Azor. La victoire d’Azor est cependant de courte durée. Antenore, un de ses lieutenants, complote contre lui avec l’aide de son ami Leucippo. L’opéra commence in medias res, au moment où est découvert le corps d’Azor, assassiné par traîtrise. Le rideau se lève de manière abrupte – sans ouverture aucune – sur la vaste plaine qui entoure les murailles de la ville de Lesbos. D’un côté de la scène, se trouve le portail imposant qui conduit au tombeau souterrain des rois de l’île. C’est la confusion : démoralisées à l’annonce que leur chef a été retrouvé assassiné dans son lit, les troupes de Mytilène errent sans but. Leucippo et Antenore font leur entrée. Ils commencent par exprimer leur incrédulité et leur douleur, puis Leucippo suggère aux soldats mytiléniens qu’Antenore est le militaire le mieux placé pour venger leur chef et succéder à celui-ci. Lorsque Leucippo et Antenore se retrouvent seuls, la situation véritable devient plus claire. Antenore est un opportuniste ambitieux et sans scrupules, tandis que Leucippo, serviteur complaisant, est coupable du meurtre. Antenore remarque, toutefois, que la mort d’Azor n’a pas éliminé tous les obstacles qui lui barrent la voie. La famille royale de Lesbos n’a pas encore entièrement disparu : si le vieux Polidoro passe généralement pour mort, trahi par Zelmira, celle-ci est bien vivante ainsi que son jeune fils. Antenore et Leucippo en concluent que noircir Zelmira ne peut que favoriser leur cause. Aussi, Leucippo commence-t-il déjà à fabriquer de toutes pièces les indices qui la feront accuser du meurtre d’Azor. Zelmira apparaît enfin, accompagnée d’Emma, son amie et confidente. Horrifiée à l’idée que la jeune femme a eu la monstruosité de livrer son vieux père à ses ennemis, Emma se retourne contre Zelmira. Celle-ci proteste de son innocence et, après avoir fait jurer à Emma de garder le secret, la conduit à l’entrée du souterrain. La salle souterraine où se trouve le mausolée royal. Polidoro, bien vivant, s’y cache grâce à sa fille. Le père et la fille se saluent chaleureusement. Heureuse de découvrir que Zelmira est innocente des crimes dont on l’accuse, Emma se reproche d’avoir jamais douté d’elle. Des cris et le son d’une marche militaire retentissent alors au loin. Zelmira et Emma quittent la scène pour aller aux nouvelles. Sur la place qui se trouve au cœur de Lesbos, l’époux de Zelmira, Ilo, est accueilli avec enthousiasme au retour de la campagne qu’il a menée contre ses ennemis. Il se réjouit à l’avance de retrouver Zelmira et son fils et, ignorant des événements qui ont eu lieu en son absence, envoie au palais son fidèle compagnon Eacide pour annoncer son retour à son beau-père, le roi Polidoro. Zelmina rejoint Ilo et, craignant de lui expliquer la situation de Lesbos devant ses hommes, fait preuve d’une extrême réserve. Ilo s’aperçoit immédiatement de son embarras et, la voyant éluder ses questions, devient de plus en plus agité. Emma se précipite alors sur la scène en pressant Zelmira de fuir, car Antenore est en train de l’accuser publiquement d’avoir assassiné Azor. Désemparé et perplexe, Ilo se retrouve seul devant Antenore et Leucippo. Ceux-ci prétendent compatir avec lui tout en lui racontant que, dès son départ pour la guerre, Zelmira a invité Azor à Lesbos et l’a pris pour amant. L’esprit empoisonné, Ilo se retire en proie au tourment, mais pas sans avoir entendu une délégation de prêtres offrir à Antenore la couronne de Lesbos. Harassée de toutes parts, Zelmira confie son jeune fils à Emma. Dans une magnifique salle du palais, Antenore est couronné roi de Lesbos. Après avoir déclaré que son seul but est de rendre au royaume son ancienne gloire, il va se présenter devant le peuple. Persuadé que Zelmira l’a trahi à son tour et incapable de découvrir où se trouve son fils, Ilo s’évanouit, terrassé par l’angoisse. Leucippo le découvre inanimé, et croyant l’heure arrivée d’éliminer le nouvel obstacle qui se dresse sur le chemin d’Antenore, sort son poignard et s’avance vers lui pour le tuer. Il en est toutefois empêché par Zelmira qui, arrivée sur ces entrefaites, le désarme. Loin de se laisser démonter, Leucippo réussit à secouer Ilo et, lui montrant Zelmira poignard en main, parvient à le convaincre qu’il a échappé de justesse au meurtre que sa propre femme tentait de perpétrer sur lui. Antenore revient à cet instant pour ordonner l’arrestation et l’emprisonnement de Zelmira. Leucippo montre à Antenore une lettre écrite en prison par Zelmira, mais interceptée par ses soins. La missive est adressée à Ilo. Zelmira lui assure qu’elle n’a pas tué son père et le supplie de venir à son secours. Antenore et Leucippo commencent alors à se douter que Polidoro a peut-être survécu à l’incendie du temple de Cérès. Sur les conseils de Leucippo, Antenore décide donc de libérer Zelmira et d’espionner tous ses mouvements. Convaincue qu’il sera plus en sûreté avec son grand-père dans le souterrain, Emma y fait conduire le fils de Zelmira par deux servantes. Non loin de l’entrée du mausolée souterrain, Ilo se lamente : il ne parvient pas à haïr Zelmira bien qu’à son avis elle le mérite. Il se désole également de n’avoir pu retrouver la trace de son fils. À ce moment précis, Polidoro, inquiet de l’absence de nouvelles de Zelmira, émerge de sa cachette. Le beau-père et le gendre se jettent dans les bras l’un de l’autre, et Ilo se réjouit de l’innocence de sa femme. Il propose à Polidoro de le mettre en sûreté sur son bateau, mais sans armes Polidoro se croit plus en sûreté et mieux où il est. Il retourne donc à sa cachette tandis qu’Ilo s’empresse de rassembler ses partisans pour se porter au secours de Zelmira. Cependant, Antenore a libéré Zelmira et l’espionne. Elle fait son entrée, sous le regard d’Antenore et de Leucippo qui l’observent à distance. Emma vient annoncer à Zelmira qu’elle a rencontré Ilo et que celui-ci lui a demandé de dire à sa femme qu’il est désormais convaincu de son innocence, qu’il s’apprête à lui porter secours et qu’il attend avec impatience le moment où il pourra la réunir à son père. Antenore et Leucippo, qui ont tout entendu, s’approchent d’elle et l’accusent de les avoir trompés. Naturellement, mais à tort, elle suppose qu’Ilo a mis Polidoro en sécurité sur son bateau. Aussi avoue-t-elle sans difficulté qu’elle a fait courir la rumeur que son père avait trouvé refuge au temple de Cérès afin de détourner l’attention de sa véritable cachette, le mausolée souterrain. Leucippo, qui peu auparavant a vu Ilo rejoindre sa flotte sans personne à ses côtés, envoie immédiatement un détachement de gardes au souterrain et Zelmira comprend alors que, sans le vouloir, elle a révélé où se cachait son père. Polidoro est fait prisonnier, Zelmira offre désespérément de prendre sa place, mais Antenore a manifestement l’intention de les tuer tous les deux. Lorsque les guerriers mytiléniens s’approchent chargés de l’urne contenant les cendres d’Azor et en criant vengeance, Antenore leur présente Zelmira comme la meurtrière. Les guerriers exigent sa mort tandis qu’Emma et les servantes les supplient d’avoir pitié. Zelmira et Polidoro sont conduits en prison. Emma et ses compagnes vont immédiatement annoncer les mauvaises nouvelles à Ilo qui se précipite au secours de Zelmira et de Polidoro. Le donjon souterrain où Zelmira et Polidoro sont emprisonnés. Affaibli, épuisé, Polidoro s’est évanoui. Zelmira veille tendrement sur lui en attendant qu’il reprenne ses esprits. La porte du donjon s’ouvre alors pour livrer passage à Antenore et Leucippo venus en meurtriers. Déterminée à protéger son père des coups, Zelmira s’interpose. Elle va jusqu’à suggérer qu’il renoncera au trône pour avoir la vie sauve, mais Polidoro refuse énergiquement. On entend alors des bruits venus de l’extérieur annonçant l’arrivée d’Ilo et de ses hommes. Antenore dégaine son épée pour tuer Polidoro, mais Zelmira produit un poignard qu’elle cachait sur sa personne, et réussit à le tenir en échec jusqu’à ce que le mur du donjon, enfoncé de l’extérieur, s’effondre et laisse entrer la troupe venue à la rescousse. Antenore et Leucippo sont désarmés puis emmenés par les gardes. Ilo retrouve Zelmira et Polidoro, tandis qu’Emma et les servantes font leur entrée, accompagnées du fils de Zelmira. L’opéra s’achève alors que Polidoro s’apprête à remonter sur le trône, et que Zelmira s’étonne avec émerveillement que tant d’épreuves et de souffrances aient pu faire place, de manière si soudaine et inattendue, à la joie et aux réjouissances.